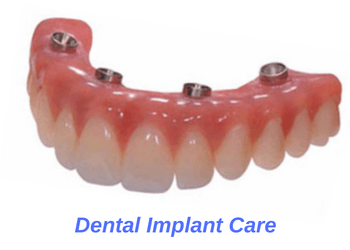 Why is it important to care for my dental implants? How should I clean my dental implants? How do I clean all-on-4 teeth? How do I clean implant-supported dentures? Cleaning dental implants removes harmful bacteria and helps prevent bone loss around the implant. Dental implants are not natural teeth and are made entirely from metal-based foreign objects. This means that dental implant don’t develop tooth cavities the way your natural teeth do. So then why is it important to clean your dental implants? Cleaning dental implants removes harmful bacteria and helps prevent bone loss around the implant. Excessive bone loss is detrimental to your implant health and can cause the implant to become loose and fail. By properly cleaning your dental implants, you remove harmful bacteria and help prevent bone loss. This will keep your dental implants healthy and sound over the years to come. Luckily, cleaning dental implants is very similar to cleaning your natural teeth. Simply brush and floss your dental implants as you would any other tooth in your mouth. You may notice that cleaning dental implants is a bit more difficult than cleaning your natural teeth. This is mostly due to the natural bone loss which occurs surrounding all dental implants. 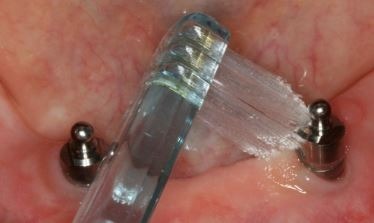 Typically, we advise our patients to use a Waterpik to better clean their implants. If you are having trouble cleaning your dental implants, you should consult your dentist for advice. We recommend supplementing a Waterpik to your hygiene routine to better clean your all-on-four teeth. All-on-four is a set of porcelain or zirconia teeth which are supported by four dental implants. Patients with all-on-four teeth have no more natural teeth left in their respective arch. To clean your all-on-four teeth, it’s best to continue brushing your gums to stimulate blood flow in the region. Also, brushing helps keep your synthetic porcelain teeth nice and clean. We recommend supplementing a Waterpik to your hygiene routine to better clean your all-on-four teeth. Using a Waterpik helps dislodge large food particles which are trapped underneath your all-on-four bridge. 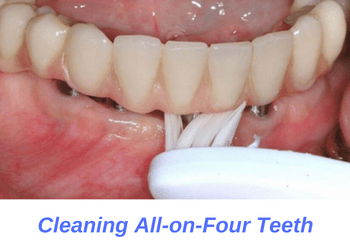 Finally, all-on-four teeth need to be removed and cleaned periodically so be sure you’re not overdue your dental cleaning. don’t forget to clean the dental implants and attachments once you’ve removed your overdentures. Implant-supported dentures, known as overdentures, are easier to clean since the denture can be removed from your mouth. Be sure to remove and clean your dentures every night. Ideally, use a soft toothbrush with liquid soap to remove debris from your denture. Feel free to use denture cleaning solution to soak your dentures to better remove calcified deposits. Pay extra attention to the denture housings, the colorful circles which lock onto your dental implants. Don’t clean the housings too rigorously or you could damage the them. Finally, don’t forget to clean the dental implants and attachments once you’ve removed your overdenture teeth.